Guests staying in a Disney Resort, is entitled to remarkable benefits like Extra Magic Hours, Disney's Magical Express, Disney's Complimentary Transportation, Disney Dining Plan - and a whole lot more. Enjoy complimentary parking throughout Walt Disney World® Resort, and complimentary resort transportation through the Walt Disney World® Resort to Theme Parks, Water Parks, the Disney Springs® area and more. Save money and enjoy the complimentary transportation to and from Orlando International Airport via Disney's Magical Express. With a Magic Your Way vacation package, you have the power to create a vacation that fits your family, your taste and your budget! 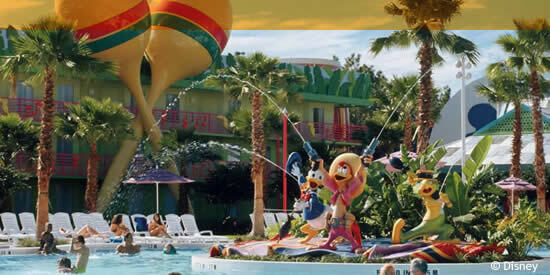 And with over 20 unique Disney Resort hotels with themes ranging from movies to beaches, you just can't go wrong! From hotels where you can splash down a pool slide to hotels where you can watch a movie under the stars, you're sure to find something fun for everyone to enjoy! From the moment you arrive until the day you check out, you'll experience incredible Disney service no matter where you turn! Select from over 100 Walt Disney World®restaurants, including imaginatively themed restaurants and Disney Character meals. Preferred advance golf tee times at Walt Disney World Golf Courses.